In case you’re wondering why there hasn’t been very much content here over the last few days, we took a vacation. To sunny (very sunny) California, where we went to Disneyland. We’d been to Walt Disney World (WDW) in Florida several times, but I’d never before seen the original (beta version) park. Here are some photos and thoughts from the trip. We have come up with a workable strategy for enjoying an amusement park without killing ourselves. First, wake up much too early. (This is likely because our home 7 AM is only 5 AM here.) This allows for a relaxing, not rushed, start. Eat a good breakfast. Be at the park at opening — you will get to do the most in the first couple of hours while waiting the least. But first, identify your handful of must-dos. These are the big-ticket rides you are really excited about. (Many other people likely feel the same way.) Read up on the parks before you go, and figure out what you think you’ll like. Head to your most-anticipated first, to start the day on a high point and spend the least time waiting. If you can grab a FastPass to another important attraction along the way, do so. Ride whatever you can until you start getting tired or grumpy. Then have lunch, then leave. Go take a nap. Wake up, shower, change, and go back later in the day. We found this particularly important, since we are pale Midwesterners, and while we were lucky to have beautiful days, weather-wise, the high 80s temperatures and the sun got to us between 1-3 PM. We stayed at the Grand Californian, which is excellent if you can afford it. 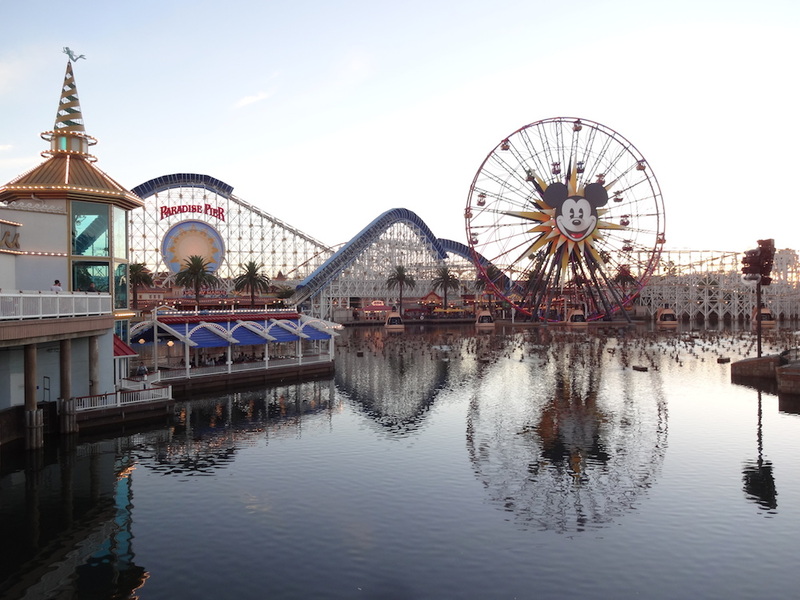 It is the closest hotel to both parks, and it has the one best thing about Disneyland compared to WDW — location. 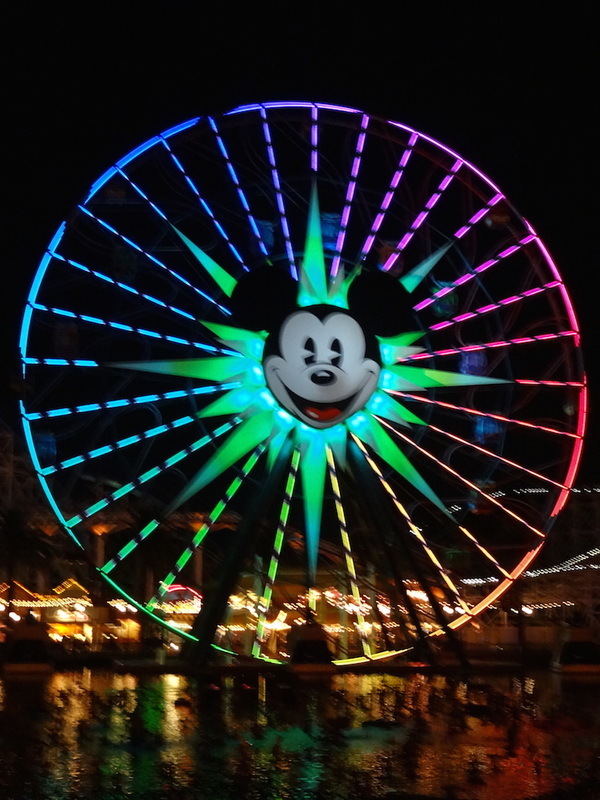 It is actually part of the California Adventure park, which makes it the shortest travel time of any Disney hotel. Our first day was spent at California Adventure, the newer of the two parks, and one that Disney has been struggling to find an identity for. The most successful bit seems to be Cars Land, which the kids adore. The theming is darned neat, with lots of thought put into a cohesive park section. Radiator Springs Racers — a track ride that KC would go on, because it’s less about the thrills and more about the experience. Fun and involving, with different sections and lots of characters from the Cars movies. The more you know the film, the more I think you’d like this. The most popular ride in the place, from what I could tell. Mater’s Junkyard Jamboree — a whirling ride that was different from what you can find at most parks. Hard to describe, as baby tractors pull you around in a kind of mechanized “crack the whip” game. Toy Story Midway Mania! — a more enjoyable shooting game than Buzz Lightyear’s Astro Blasters (in the other park), because it’s easier to see what you’re doing and more fun, with pie-throwing animation and such. Enjoyable for all ages. Got to ride this twice thanks to a wonderful park employee who took pity on me after my roller coaster shakedown (see below). Golden Zephyr — I rode this elevated spinner at night, which made for a cool breeze and a lovely vision, seeing the park all lit up. Soarin’ Over California — We’d done this before in Florida, but it’s still gorgeous. Our first ride, early in the morning, which was a great start to the day. Muppet*Vision 3D — although it is the exact same thing as its Florida cousin, the movie print seems clearer. Monsters Inc. Mike & Sulley to the Rescue! is a drive-through ride where you sit in a car on a track while moving through recreations of scenes from the movie. While I am nostalgic about rides like this in Fantasyland (see below), it seemed disappointing for ride based on a modern movie to take this approach. Reportedly, this is a repurposed “ride a limo like a star” ride that was re-themed when they dropped many of the California-specific attractions. 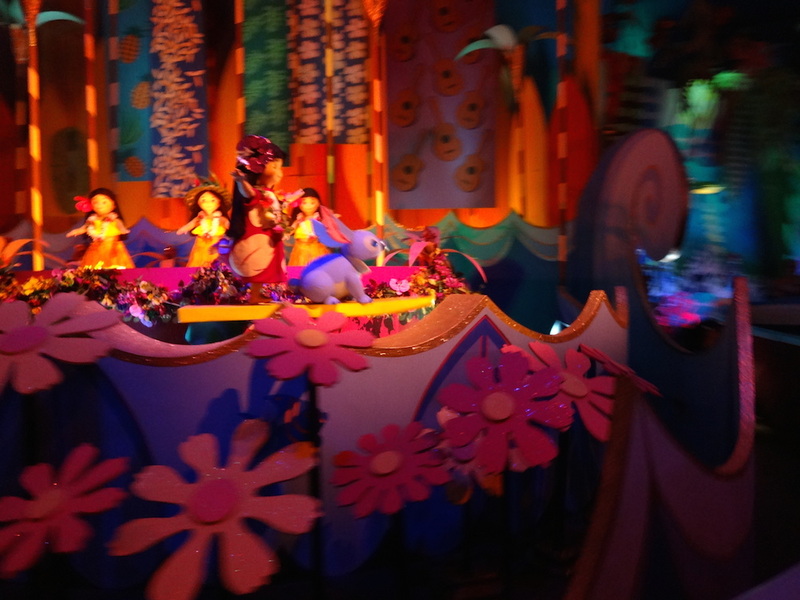 The Little Mermaid – Ariel’s Undersea Adventure does the “ride through the story” much better. Maybe it’s the music that improves it. Each of us has ridden the Twilight Zone Tower of Terror before (in WDW) separately, and so we refuse to do it again. Love the theming leading up to the ride of the abandoned hotel, though, although there’s much less of it here. We skipped A Bug’s Land entirely, since it seemed aimed at the kiddies. Given the timing of our visit, there weren’t a lot of evening shows, but we loved the World of Color. Lights and fountains in front of the big ferris wheel, and parts were even better than fireworks. We were happy that we seemed to be able to do everything we wanted in a day, topped off by the light show, and satisfied when we left. Pirates of the Caribbean — so much better than WDW. It’s a longer ride with a more exciting boat track (including a couple of drops I did NOT expect). If we weren’t too tired to walk all the way back, I’d ride this a couple more times. It’s a Small World — I love this ride. I adore Mary Blair’s designs, and I thought it was neat to see movie characters sprinkled in (Alice in Wonderland in England, Woody and Jessie in the American West, and so on). We rode it twice in a row at night, and it was beautiful. I was impressed that the ride is so much bigger than at WDW, with its own building and several nearby snack areas themed to match. The Enchanted Tiki Room — a great place to sit down for a while and admire the kitschy puppeteering. Same goes for Great Moments With Mr. Lincoln, although that one is a lot more patriotic. These attractions capture the original imagination and ingenuity that made Disney the powerhouse it is today. 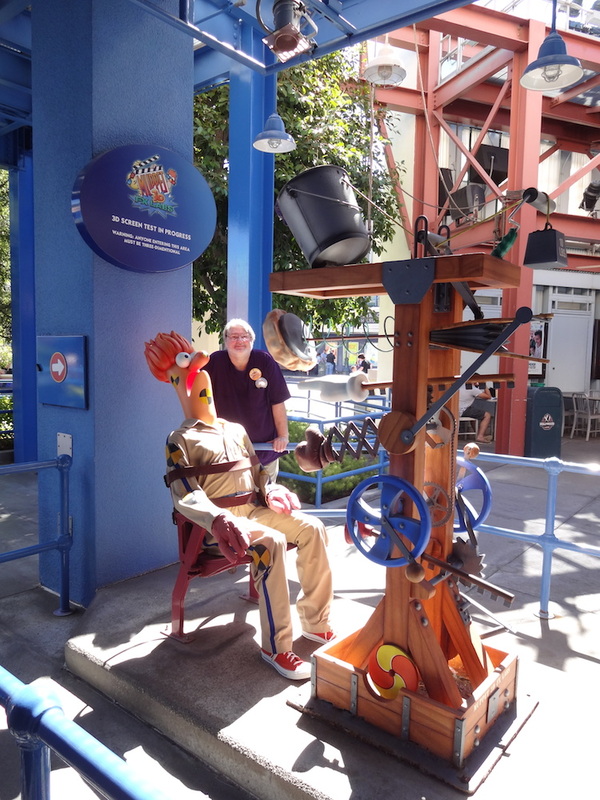 Roger Rabbit’s Car Toon Spin — silly but neat for a fan of the film. We took the Railroad over from Main Street, which worked well, and the train is another cool nostalgic ride. 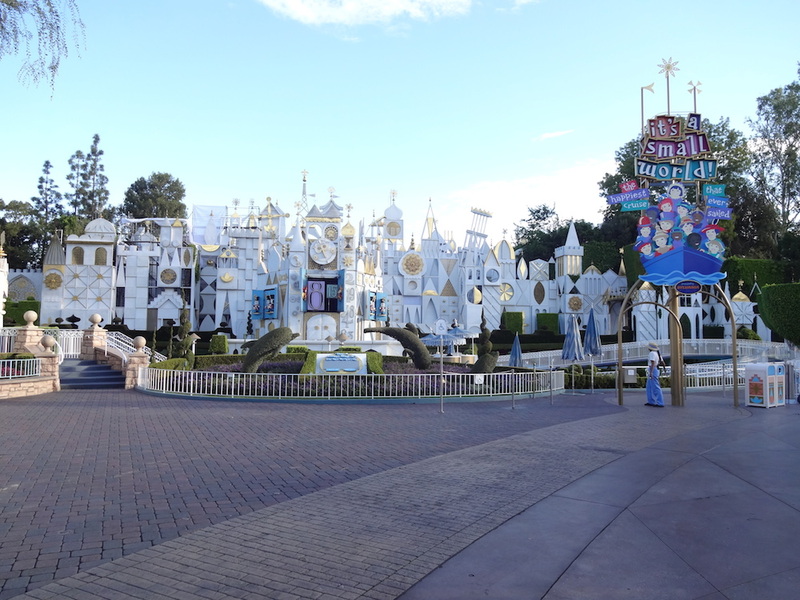 Our flashback morning, where we rode Pinocchio’s Daring Journey, Snow White’s Scary Adventures, Mr. Toad’s Wild Ride, and Alice in Wonderland all in a row. They’re all “ride through the story”, but they’re old school and charming. KC particularly liked the way the doors opened to let the cars through to another scene, since it kept you focused on what you were supposed to be looking at. I was sorry to miss Peter Pan’s Flight, but a 30-minute wait is ridiculous. I think, since it’s the first one in the land, people just stop as soon as they get there. I should have known better, given my comments about the coaster above, but I started with the Matterhorn Bobsleds. Bad idea. It’s an old ride, and my general response was “these cars need more padding”. You’re sitting on plastic and being jounced around as it clunks through the curves. The kids near me seemed to love it, though. The Haunted Mansion had been given a Jack Skellington/Nightmare Before Christmas makeover. I was looking forward to seeing it, but it was disappointing, because the add-ons weren’t as cleverly done as the original ride. I missed those ghosts and tricks. I don’t like the movie as much, so perhaps fans enjoy seeing the characters more. Space Mountain had also been ghosted for the holiday, but I didn’t notice much difference. I think the WDW Aerosmith coaster has spoiled me, since it is so smooth and adrenaline-pumping that the other roller coasters seem clunky and jerky in comparison. We skipped Big Thunder Mountain (and Frontierland entirely) after not enjoying the other coasters. The Indiana Jones Adventure was the top attraction here, in terms of popularity. Even with a Fastpass, we waited a half-hour for four minutes of being shaken in a box. We thought it was more simulator, less track ride (like Star Tours), but no. Not worth the effort, and bad on the back. Disney made a really great move when they acquired Lucasfilm, though, since there was Indy and Star Wars stuff everywhere. I was curious about Finding Nemo Submarine Voyage, but we were feeling claustrophobic and thought a small vehicle under water wasn’t the best choice. Tomorrowland also had a Big Hero 6 preview, but it wasn’t running when we were there due to audio difficulties. 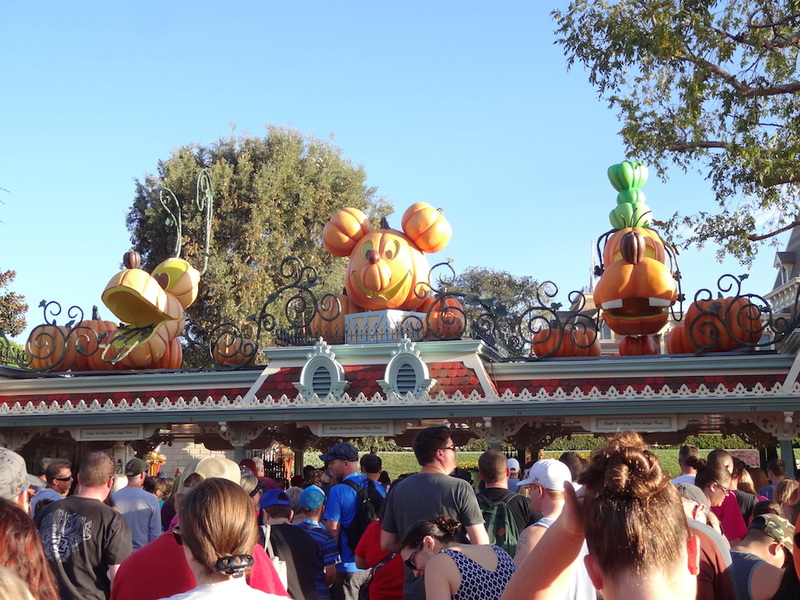 Compared to WDW, Disneyland has a paucity of restaurants, particularly if you’re looking for something sit-down (table service) instead of grab-and-go. However, we did enjoy the Wine Country Trattoria for dinner (in California Adventure), with choices that both I (a gourmet) and KC (who likes food basic) could enjoy. Another day, for lunch, the Carnation Cafe had a great salad with shrimp, avocado, bacon, and blue cheese. Not too heavy but really filling. It was great getting to compare and contrast rides and try the ones they don’t have in Florida, but I think I’ll stick to WDW in future. There’s much more to do and less crowding, with the greater amount of space allotted to the four parks. Also, more choices of places to stay with a greater range of prices and much better options for dining. Sounds like a fun trip! How long have y’all lived in WI now? I kind of smiled at the Midwesterners thing since you lived so long in Richmond. But I bet the weather there is far, far cooler. I just went to DisneyLand for the first time over the summer. I thought it had more shade than you seem to have found, though the area by “Soarin'” is insanely hot and unshaded. It’s been 2 years in Wisconsin, James. Augie, it’s true, they try to shade as much as they can — which might be why I spent three days in the California sun and picked up no color to my skin at all. We did end up walking through Downtown Disney, because it was the only way to get from our hotel to Disneyland. They had just opened Anna & Elsa’s Boutique, it seems, full of Frozen t-shirts and makeovers.